How can anyone with even a passing interest in anime not be familiar with the incredible library of work from master craftsman Hayao Miyazaki? Miyazaki is sheer genius, he is an unparalleled storyteller and his films have a unique visual quality stemming from a European influence. He is one of the very few Japanese animators to achieve international acclaim for his films, as well as the only one (so far) to win an Academy Award for best animated feature. His films will touch you and inspire you, these masterpieces are truly the high-point of all anime. Jiro dreams of airplanes constantly. He envisions their flightpaths and wishes to pilot them himself, however, his poor eyesight promptly halts that aspiration. Upon having a dream featuring the famous Italian aircraft designer Giovanni Caproni, he is instead sent on another path: designing airplanes. He obtains a degree in engineering in 1927 and begins working for Mitsubishi. Although first suffering some failures, he eventually creates the prototype for the iconic design we'll later see flying. During this process, he encounters and becomes engaged to a young lady named Nahoko Satomi. Though afflicted with tuberculosis, Nahoko remains passionate and supportive of Jiro throughout his career. Miyazaki is clearly passionate about aircraft and often waxes poetic about them through Caproni in Jiro's dreams. The script serves this purpose whole-heartedly, sometimes to the detriment of a cohesive story. Miyazaki wanders about, meandering between scenes, taking his time to bask in each moment before rushing through the years to another plot point. It's indulgent and purely to satisfy the director's whims, all while backed by a more morbid untone of the planes' true purpose. Let's not dance around the subject too much: these planes were used to kill. Near the end of the film, Jiro speaks to Caproni in one last dream, expressing his regret at the fact the planes were used for war. Caproni sighs at the destruction, but says "there was nothing to come back to." Miyazaki never quite confronts the violence head on, instead opting for platitudes. 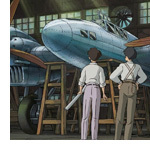 Perhaps your own love of aircraft will affect how the film appears to you, much at it affects Miyazaki himself. Despite those concerns, Studio Ghibli puts on quite a show. The Wind Rises is packed with gorgeous animation from beginning to end. The Great Kanto Earthquake of 1923 stands out in particular as a fantastical interpretation of a terrible event. The ground twists and rolls like an incoming wave, tossing meticulously-animated debris as it barrels forward. In addition, the various planes seen in the film are detailed and captivating. It's often said the Ghibli's food is depicted so well it'll make you hungry -- likewise, their aircraft give you the childlike urge to want to fly, experiencing the wind in your hair. The Wind Rises may not be remembered as Miyazaki's best film, but it may well be known as his most personal one. Despite its meandering nature, the pure love of flying shines through. Despite the glossed-over violence, you can still sense Miyazaki's melancholic feelings. Despite it running a tad too long, you'll still find yourself getting wrapped up in the film like a soft, warm blanket. Perhaps that just goes to show that even when things go wrong, the talent of Hayao Miyazaki and Studio Ghibli is still enough to create a compelling and engaging movie. They're the masters of their craft, and even if they disband, it'll be a long time before anyone new can come along and knock them from their perch. I couldn't wait for the DVD to hit American shores so I just jumped the gun to start my review by seeing the release in an honest to goodness movie theater! Chances are you've already seen it, since the buzz on the internet is big, and let's face it, there's a zillion places to download from these days. Ponyo is big news for a number of reasons. First of all Miyazaki is supposed to be retired. Secondly, ... dammit, it's MIYAZAKI !!!!!! The man who can do no wrong, the midas-touch of anime, has he ever made a flick we didn't think was well-above average, dare we say genius in every respect? Here's the good news: Ponyo is a delight. And if you've ever heard of "The Little Mermaid", you've already got a handle on the premise. 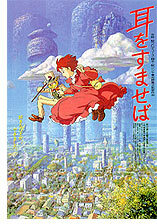 A refreshing change from all the explosions in this summer's movies, Ponyo is G-rated faire, and wonderfully so. Less intense than say, Princess Mononoke, Ponyo is a simpler, more easy-going work, more along the lines of My Neighbor Totoro. With an all-star voice cast which was directed by Pixar's John Lassetter, Ponyo never stops being what it really is; a nice Miyazaki film, with an impressive use of color, a visual direction that is unmatched, and a subtle, and yet noticeably-there environmental message that continues to celebrate the innocence of childhood, when magic can make dreams come true. At long last history is made this year as an anime film wins the Oscar for 'Best Animated Picture' at the Academy Awards. Japanese animation master Hayao Miyazaki's stunningly imaginative supernatural adventure about a plucky little girl in a world of ghosts bested four much higher-profile American opponents, proving quality counts. Using his unique trademark style, along with some very subtle computer animation, Miyazaki has weaved a lush spirit world, while Jo Hisashi breathes life into the film with yet another beautiful score. This is a film no anime fan should miss because it's perfect in every detail. Children and parents alike will find it fascinating. His films are simple and heartwarming, with a child's view of the world, where everything is a new adventure, and no problem can't be overcome with love. They are chock full of what we humans define as "soul". 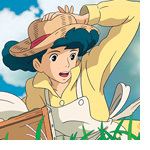 Whisper of the Heart (Mimi o Sumaseba) follows the basic formula closely enough to be Ghibli canon. It concerns a reclusive bookworm of a 14 year old girl who harbors aspirations to become an author herself. As will happen with the Miyazaki magic, she meets a boy. And of course, they do not get along at all, but this is certain to lead to love. The story is deceptively simple and yet, you'll be spellbound for the entire length of this feature. Why? Because it's Miyazaki, and nobody... NOBODY crafts a story like he does. The supporting cast ingeniously helps to resolve and teach us about the main characters, as we cherish the little moments in the film that grasp at our heartstrings, help us to discover the love of life, the brilliance of youth and audacity of hope. Produced and written by Hayao Miyazaki and created by the impeccable staff of Studio Ghibli, this is the only film to be directed by the late Yoshifumi Kondo, who was being groomed by Miyazaki as his successor. Unfortunately Kondo died in 1998 of an aneurysm, leaving us this film as his legacy. We admit it's almost a cop-out at this point to list a Miyazaki film. It's like cheating, because you KNOW we're going say it's fantastic, incredible and an anime classic that you cannot live without. However, this is the master's most bizarre film, concerning a 1930's era pilot who has been transformed into a pig. On the surface, it's just weird. But of course, being Miyazaki, there's more. Way more. It's a charming, bittersweet light adventure film that will bring a smile to the face of anyone with a pulse. There's an elegant magic to it that cannot be easily defined because everyone who watches it finds something differently 'deep' about the film. It's as if our own personal demons allow us to relate to the characters and situations in our own way. Thus, Porco Rosso is also one of Miyazaki's strongest films, and his most personal. This film is absolutely, positively guaranteed to bring tears to your eyes — it's just that good. No anime collection is complete without it. This is the Citizen Kane of anime, a film that can be appreciated by children and adults alike, and for many who have seen it, a life-altering experience. Steven Spielberg considers this to be one of his favorite films. So do we. This may be one of the greatest action-adventure comedy-romances ever made, animated or otherwise. Directed by Hayao Miyazaki (Laputa, Totoro, Mononoke) it's guaranteed to please everyone who watches it. That action starts five seconds into the film and never lets go, culminating in a fantastic battle that Disney shamelessly ripped off in "The Great Mouse Detective". Considering the film is over 20 years old, the animation is still amazing even by today's standards  consider the scenes where Lupin drives his Fiat 500 straight up a wall (in the best car chase we've ever seen), or later, where he's scaling the roof of the castle and everything is moving in the frame perfectly  it is just to die for. All this topped with Yuji Ono's inspired soundtrack make this one of the most perfectly crafted and executed films of all time. Absolutely not to be missed. Most anime fans have seen at least some of the classic films brought to life by esteemed director Hayao Miyazaki: My Neighbor Totoro, The Princess Mononoke, Spirited Away, etc. However, how many fans have seen the films he made back when he was just a hired hand at Toei Animation, years before founding the highly respected Studio Ghibli? One of those films, Animal Treasure Island, a 1971 production from that Miyazaki played a major role in creating, hasn't aged as well as one might have hoped, but for the seasoned anime fan, it provides something priceless: the chance to be a Miyazaki hipster. You just know you want to be able to say you know his work from before he was famous. The film is a loose adaptation of the Robert Louis Stevenson classic, featuring a young boy named Jim who stumbles over a map of the mysterious Treasure Island. 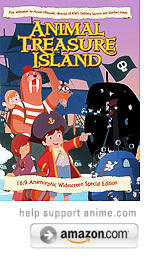 For some reason never explained, most of the characters are talking animals: Jim's best friend Gran is a mouse, and the pirates are made up of walking cats, dogs, monkeys and so on. Kathy, the feisty female lead who has her own reasons for seeking Treasure Island, is one of the only other human characters in the movie besides Jim. Since the animals act more or less the same as humans, at first we were wondering if there was any point to animalizing the whole cast, beyond a few cute and cuddly character designs. However, the animal characters lend a Looney Tunes-like charm to the whole thing, which is appropriate considering the tone of the film is much closer to old school, Warner Brothers-style slapstick than most anime fans are used to. In fact, at times we actually felt like we were watching an extended Looney Tunes episode, which strikes a nostalgic cord. The cartoony humor may make the film seem perfect for young children at first, but parents beware; while the grand majority of the film is unobjectionable, there are one or two moments that might give some people pause before showing the film to their five-year-old. At one point Jim and Kathy are asked to dig a hole by some pirates, who then taunt them with the prospect of the hole becoming their graves. Late in the film, a villain slaps Kathy hard in the face, something usually taboo in children's shows. While some may find the show inappropriate for children for the above reasons, it's not really meant for adults either. The simple, swash-buckling adventure remains entertaining throughout and has some nice moments, but it's hard to recommend over more modern fare. The animation seems pretty good (by 1971 standards of course) but the consistently green ocean is a little strange, we must admit. However, as a piece of anime history- both for Miyazaki fans specifically and all those who want to know what anime looked like many years before the modern animation techniques and styles that we now take for granted- it's definitely worth a look. The simple, clean character designs are very appealing, and watching Kathy out-pirate the pirates with a set of antique pistols is always worthwhile. We watched the subtitled version primarily, but checked out the dub for comparison purposes; while there's nothing wrong with the English language performances (which are exactly what you would expect, nothing more and nothing less), a poor audio mix made it hard to hear the characters over the background music. 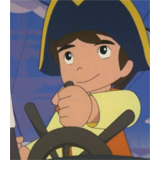 For this reason, we recommend watching Animal Treasure Island subtitled. Yes this film is retro, but what makes this a timeless movie is to consider the artistic participation, it is literally a Japanese Animation Industry's "Whoís-Who" roll-call. Different scenes in Japan animation projects are responsible by a different animator that would later be credited under the character designer. 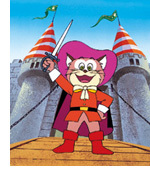 Pero's character design is by Yasuji Mori who is credited with being the first Japanese animation director. He is also responsible for supervising this movie. One of the key animators in this film also happens to be a fellow named Hayao Miyazaki. 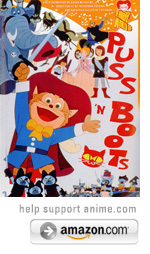 This movie was created decades before Studio Ghibli was formed, but for those who have seen the Castle of Cagliostro, Castle in the Sky and The Cat Returns should see influences from this earlier work. 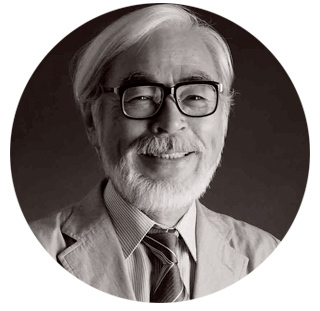 Today Hayao Miyazaki is probably best known for his films Princess Mononoke, My Neighbor Totoro and Kiki's Delivery Service which feature lavish animation and a sophisticated treatment of their young heroes. However back in 1982 Miyazaki found himself with few film prospects, so he agreed to begin work on a manga to be serialized in the popular animation magazine Animage. This series has been collected into four paperback volumes, which in 1,060 magical pages presents a fantastic epic that will have you hooked. The story reminds one of the charm of the Wizard of Oz with the futuristic ecological themes of Dune. Set in a future where the world has been poisoned by industrial waste and other ecological horrors, the story is about a young girl in the wilderness fighting giant insects and clashing tribes. Nausicaa is a unusual hero as she is a pacifist who not only rejects violence, but she has a calming effect on both the creatures and people she encounters. Yet she is also an accomplished fighter, which is evident on the rare occasions when her rage overpowers her compassion. When her beloved Valley faces invasion Nausicaa embarks on a journey to save not only her people, but also the world. The adventures that follow form a tale of honor, compassion, the folly of tampering with nature, and the power of love and friendship. This is a masterpiece of comic art and literature. This lavishly illustrated book (the release of which, was obviously timed to coincide with the release of Howls Moving Castle) spares no expense to showcase some of the very best of the body of work from the master of anime, Hayao Miyazaki. Starting as a study of the visual language of manga and anime, the book presents an overview of the mediums as a whole including processes involved as part of both traditional cel and computer generated (and computer assisted) animation, but specifically focuses on the output of Miyazaki during his earlier years before the founding of Studio Ghibli. The book then moves into Ghibli era, highlighting all of his most famous works including Laputa, My Neighbor Totoro, Princess Mononoke, and Spirited Away. 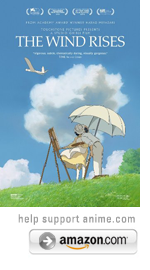 Aside from touting Howl's Moving Castle as the studio's latest release, the book also delves into Ghibli's "non-Miyazaki" productions as well, including Grave of the Fireflies and The Cat Returns. Overall, this is an excellent book and a worthy addition to any anime fan's library. Miyazaki fans will, obviously, find the book one of the most in-depth yet so far (in English) regarding our favorite director, and the discussions of techniques used will be fascinating to those who know little about the magic that goes into creating animated films. In this dissertation of Spirited Away, there are comparisons with Alice in Wonderland, and Miyazaki's previous work in light of his usage of the female heroine. Chihiro is seen to be the most similar in theme to Kiki from Kiki's Delivery Service. 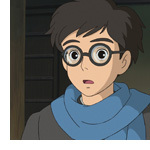 Miyazaki had made this movie with a desire to appeal to children on being stronger in spite of how personal life has those hurdles of growing up. Similar to other books on Miyazaki, there is mention of Studio Ghiblis other films, as well as Miyzaki's relationship with Isao Takahata and Toshio Suzuki. Miyazaki was already around 60 years old when he directed this award-winning film, and what was mentioned if not already questioned in this book is how would the Japanese animation film industry go after the passing of certain directors? 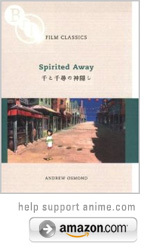 There was an argument that was definitely not presented during the publication of Spirited Away, but it seems as though there was a disagreement between supervising animator Masashi Ando and Miyazaki that would result in Ando leaving Ghibli after this project. That said, if you're interested in seeing "behind the scenes", with un-retouched background art, character designs, rough sketches, storyboards, camera techniques, and more, then you need to get your hands on this book, as it will inspire your creative spirit, light a fire in your heart, and make you want to draw and draw some more. As a (former) animator, these books are what I most treasure, as each one represents the creative output of hundreds of people, and what's nice is that you can see their hands at work here, while the finished film is polished to represent only the director's vision - this is more raw, where the creativity flows like water, with concepts unrealized in the final product. As a Miyazaki fan, heck, as an ANIME fan, you owe it to yourself to pour through these pages and understand what it takes to make a film of this caliber. Hayao Miyazaki's Academy-Award-Winning masterpiece of a movie comes to us this time as a film-comic, which is to say that the actual film frames are printed up and used to create a comic with word balloons. Although these are common in Japan, it's rare that we can find these in America — and in English, but VIZ Comics has devoted itself to bringing to you as many of Miyazaki's films as it can. Direction Hayao Miyazaki has made some amazing films like Kikis Delivery Service and Princess Mononoke, and Spirited Away follows in that tradition. 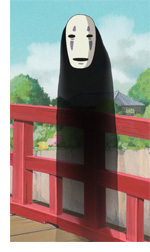 This book takes more than one look to completely enjoy the total artistic scope of Spirited Away. The book opens up with a intro from Miyazaki, followed by a nice chapter which features watercolor pencil sketches and concept art, a treat for those of us who love pre-production artwork of character designs and detailed architectiral drawings. Other chapters feature actual art used in the movie, like background paintings and animations cels of the characters. But the book features more than pretty pictures as there are interviews with the animators which give you insights into their creative process. This book is not only a must for Miyazaki fans, but anyone who loves the craft of animation film making.